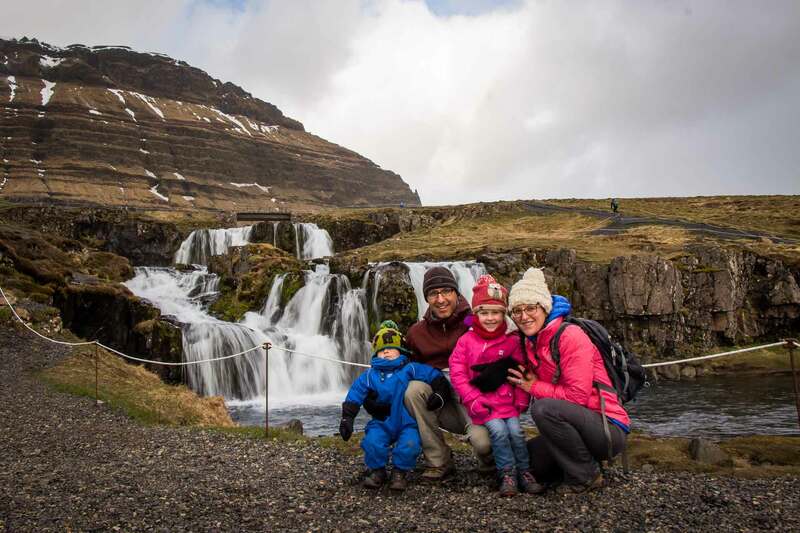 If you love impressive natural monuments, looming cliffs, sweeping vistas, deep forests and lazy boat rides through beautiful gorges, then we have the hike for you. 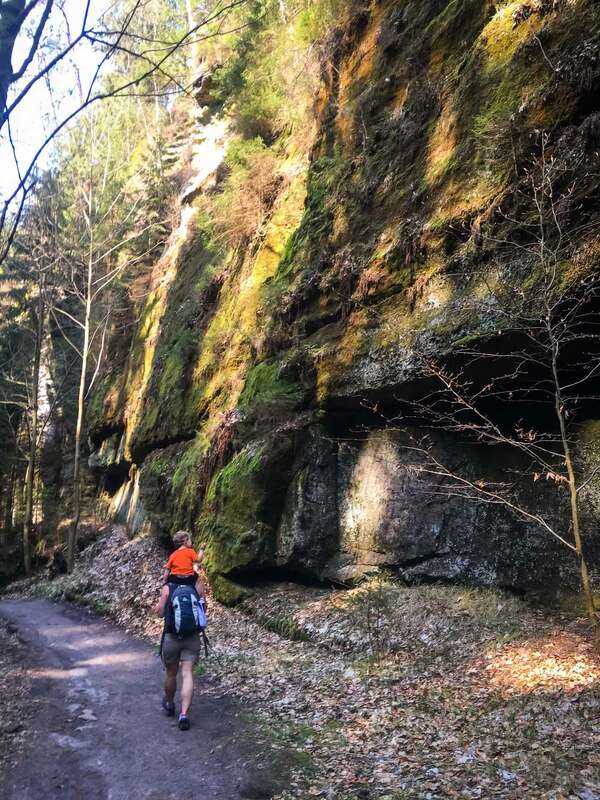 A loop starting and ending in Hrensko, this 12.5 mile (20km) hike provides some of the best scenery the Czech Republic has to offer, including a visit to the largest natural stone bridge in Europe. Including the short boat rides, we hiked the full loop in just over 6 hours. 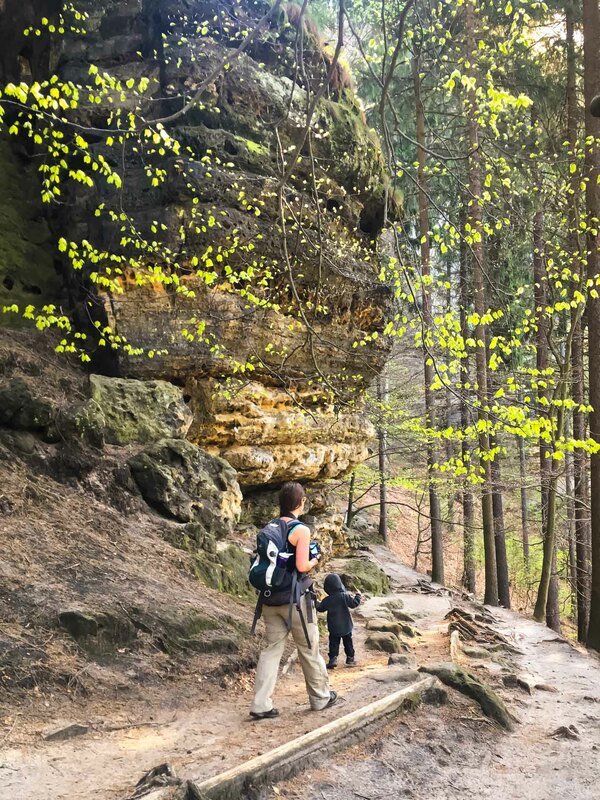 From the parking lot in Hřensko, it’s about a 1 mile (1.5km) walk along the highway to the trailhead. It’s not as bad as it sounds, there’s a pathway off to the side, there’s a stream running alongside and it’s deep in the forest. Once on the trail (follow the red trail markers) we climbed uphill pretty steadily for about 1.2 miles (2km), until we reached the junction where you turn off to see Pravcicka Brana – the largest natural stone bridge in Europe. 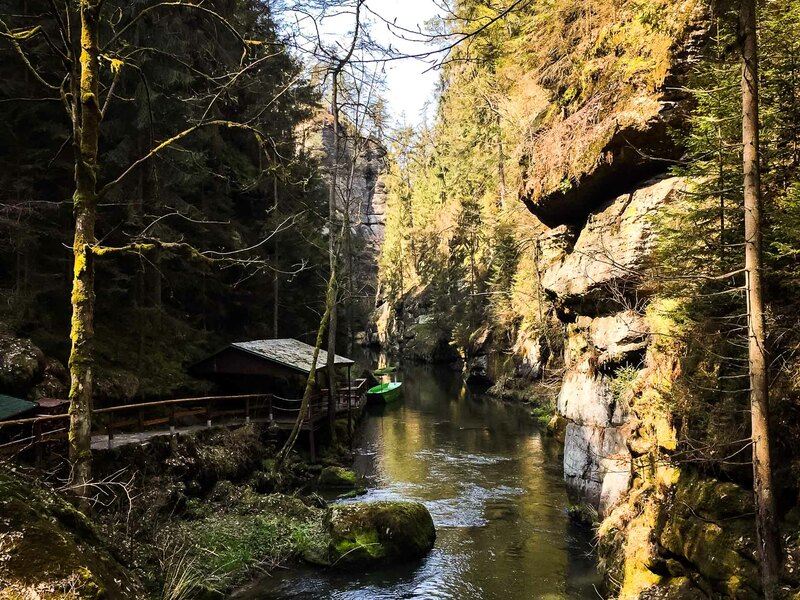 The path to Pravčická Brána starts snaking upwards, higher and higher, over bridges and through caves, until you get your first glimpse of the archway. The stone bridge is monstrous and is a truly amazing sight – well worth the effort to get up there. At the top of this pathway is the Falcon’s Nest chateau, which is now home to a period restaurant. You pay a 75kr (~$3.50USD) fee to go past this point and continue along the trail to higher and presumably better viewpoints. Unfortunately, due to our early start, we arrived at this point at 9am, but the gate didn’t open until 10am. The gate was locked and we were forced to turn back. It’s not a big deal, we were able to get excellent views of the arch on the trails which were open and we were happy to continue our journey. We walked back to the junction and still following the red trail we continued east on Gabrielina Cesta (Gabriella’s Path). This is an exceptionally beautiful stretch of the hike. 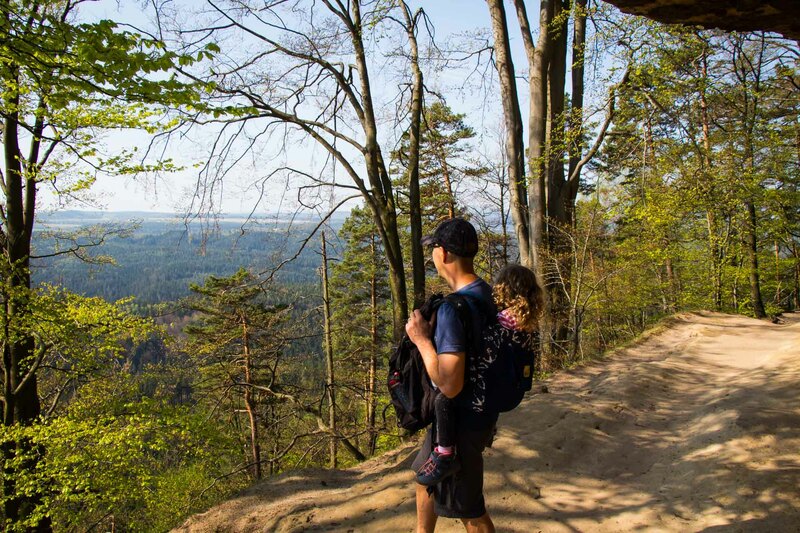 On your left are towering sandstone cliffs, while on your right is deep forest, with views of the flat lands stretching out far below. 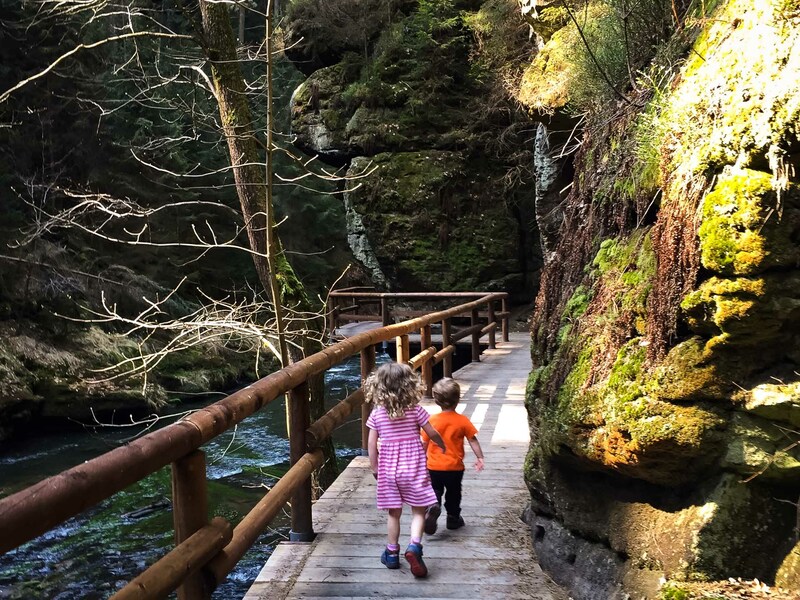 Many of the rocks hug the pathway and are carved into fun shapes or into interesting stepping stones which the kids found fun to climb. As you near Menzi Louka, the red trail starts descending quite steadily. 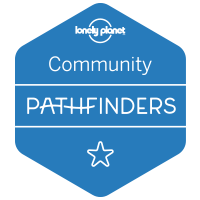 Once you get to town, walk east a block or so, past a playground, then turn right and start following the blue trail. 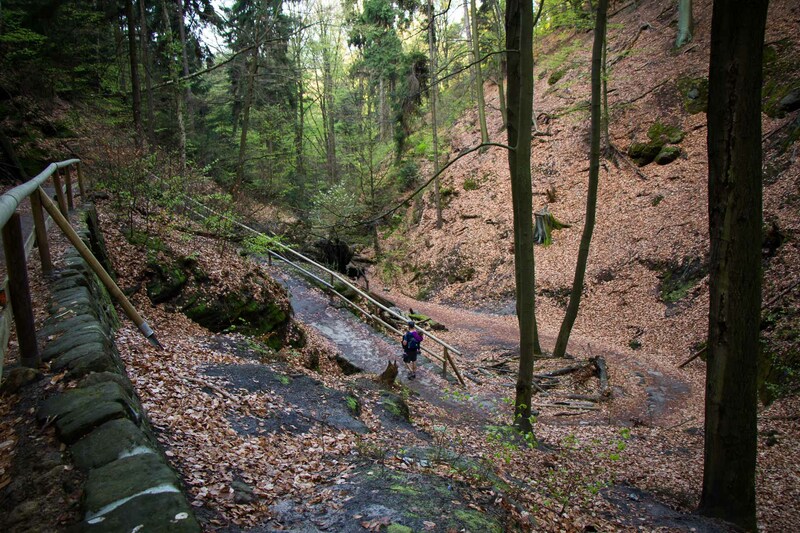 This section is an enjoyable downhill walk through deep forest. After 15-20 minutes, you turn right onto the yellow trail. The hike really becomes a lot of fun at this stage. Soon after joining the trail, you meet a river and the path starts to run parallel it. 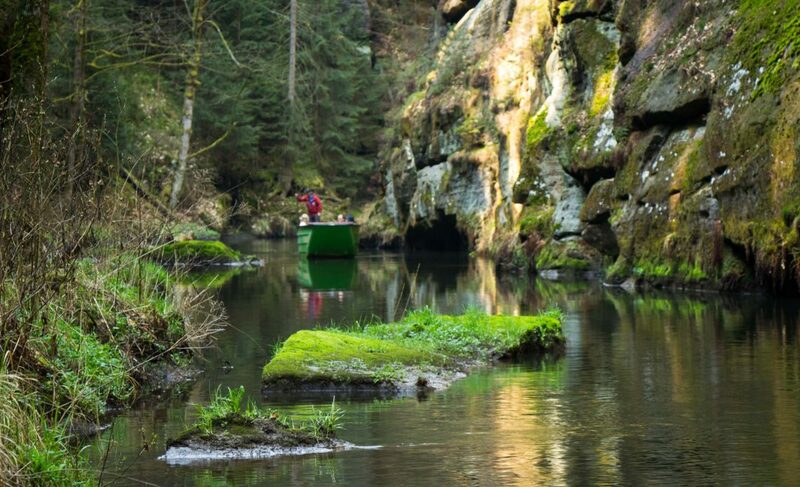 You are now at the bottom of a deep gorge and are following the river flowing through it. The path alternates between being on land and on elevated wooden pathways over-top the river. The scenery here is insanely beautiful and it really is a special hike. Soon, you will come to a little wooden hut followed by a boat dock. At this stage, you need to board a boat for a short boat ride down the canal. Each adult costs 75kr (~$3.50USD) – check with the attendant in the hut whether you pay at the hut or on the boat. The boats are powered by a guide who uses a long pole to propel the boat forwards. They will point out many interesting things along the way, but they will speak primarily in Czech. We were lucky to have some helpful translators on our boats. All too quickly, the relaxing boat ride ends and the fun, riverside hike begins again. After about 15 minutes, you come to another hut and dock, where you repeat the process. 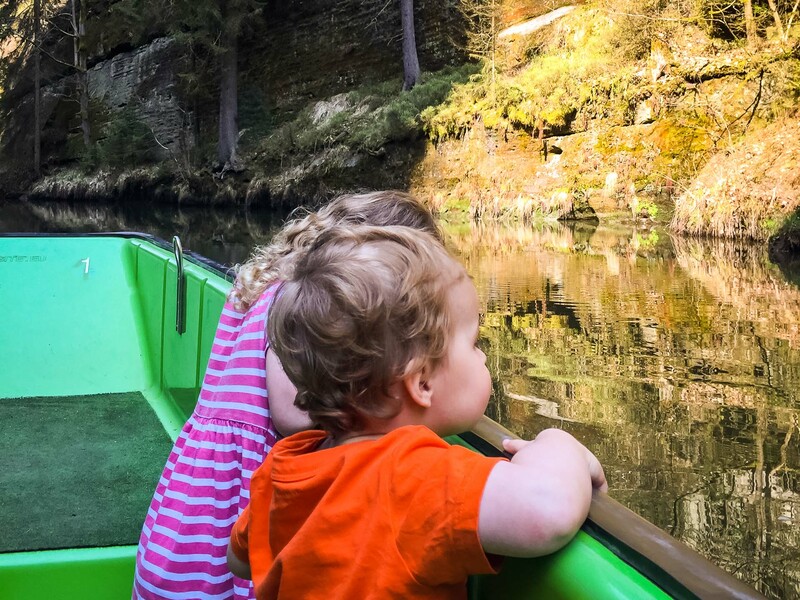 The boat rides are a lot of fun, but they are short so try to savor them while you are on them. Once you disembark from the second boat, you begin the last 20 minute leg of the hike back into Hrensko. 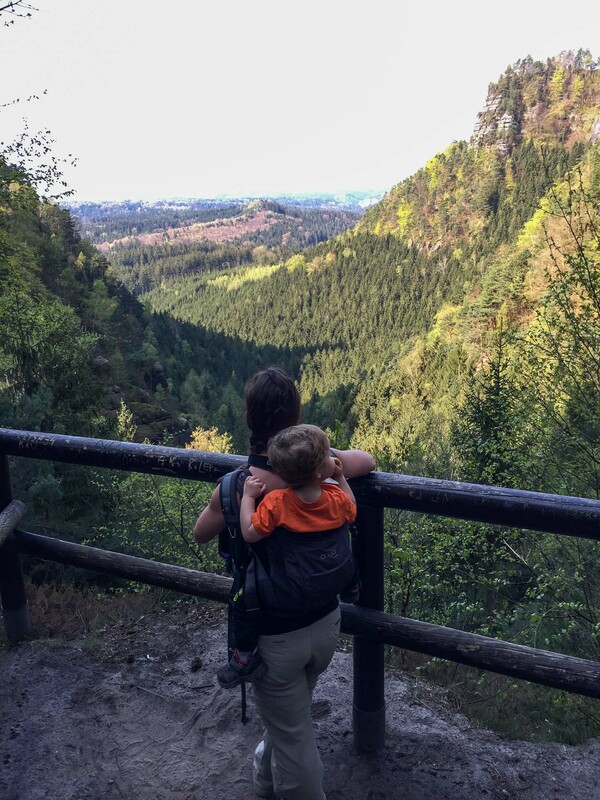 Enjoy the last few miles of this world-class family hike. 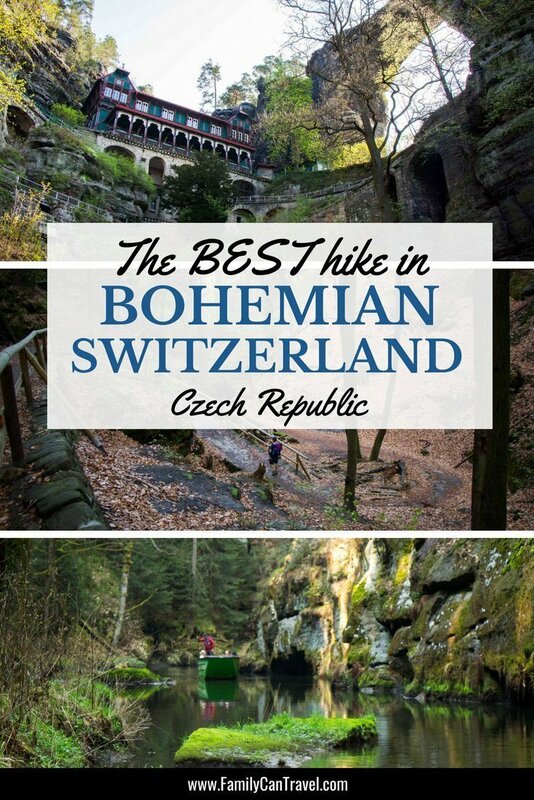 What’s amazing about this hike is that from the point you pass the Pravcicka Brana junction, it transitions to a nice, easy level or downhill walk. From this point, the remaining 11 miles (18km) to the end of the loop, there is hardly any noticeable uphill to walk at all. 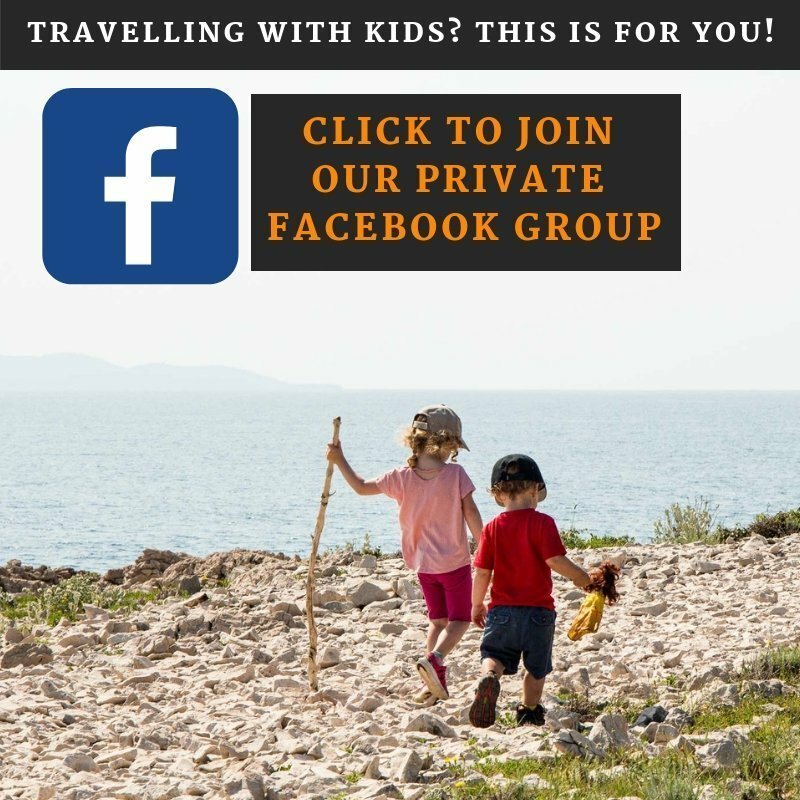 This makes it great for kids, as long as they are ok walking or being carried up to Pravcica Brana. For navigation, we used the Terra Maps Pro GPS Hiking Maps app to make sure we stayed on our intended path. The trails are reasonably well marked, but there are a ton of hiking trails in the area and it’s not always clear which way you need to go. The app really helped us a lot. We were able to complete the loop in 6 hours. We did it in mid-April, so the boats were not very busy and we didn’t have to wait long. We understand the wait for the boats can be quite long in high season. We carried our kids (aged 2 & 4) most of the way, but we estimate they each walked around 3 miles (5km) each. Note: There is no parking at the trailhead. You can park in Hresko or Menzi Louka and then walk to the trailhead or take the bus. 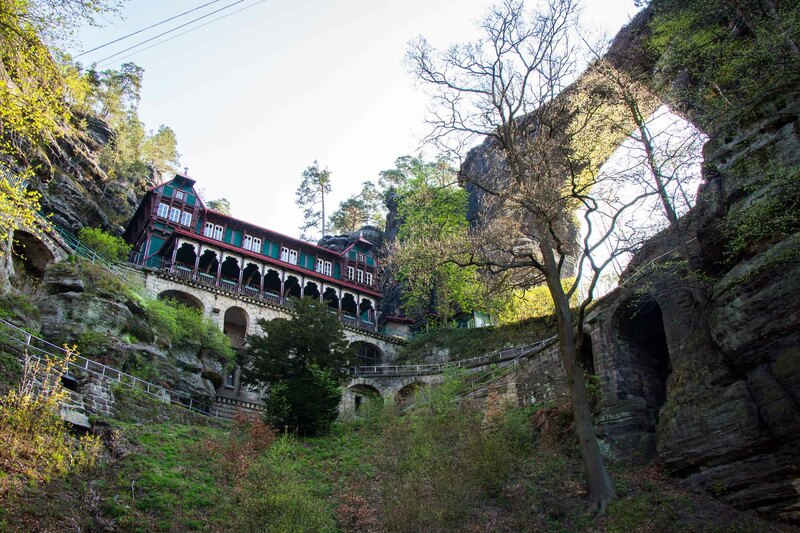 How to get from Prague to Decin. It is possible to get to Hrensko from Decin via train or bus. The trailhead is reachable by foot from Hrensko. 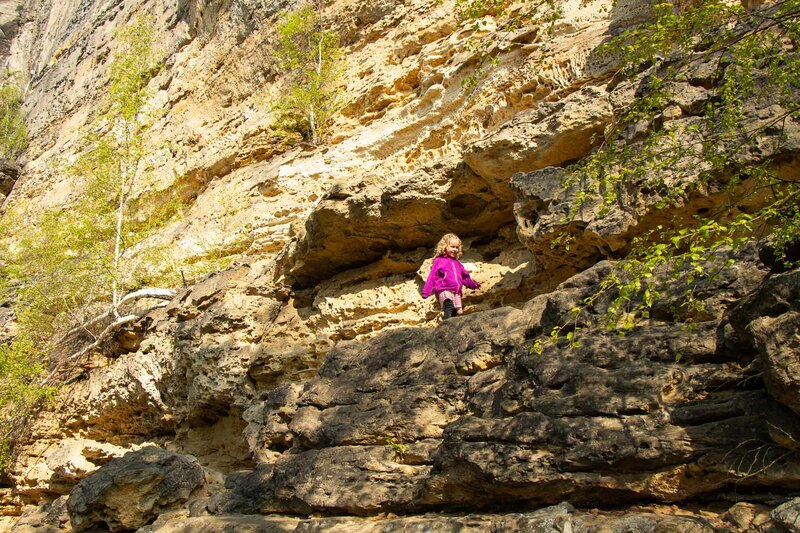 If you want to do some additional hiking in the region, you’ll need a rental car. Family Friendly Airbnb and VRBO rentals. If you are new to Airbnb, sign up with our link for a $35USD credit towards your first stay. Amazing, I feel amazing as I’ve found your blog. We are going to Prague with a 2.yo and want to hike, however was not entirely sure about the routes. Now I feel good 🙂 Thank you for sharing! I’m so glad our posts were helpful! Please don’t hesitate to contact us if you have any questions!